A Sunday Afternoon on the Island of La Grande Jatte is one of the very famous art works of Georges Seurat and is a great example of Pointillism. Current Location: Art Institute of Chicago. 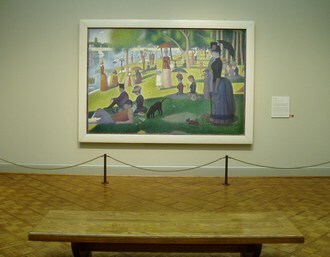 A Sunday Afternoon on the Island of La Grande Jatte For Display At Art Institute of Chicago. Seurat started to paint ‘A Sunday Afternoon on the Island of La Grande Jatte’ in the summer of 1884 and he completed this work in two years i.e. by 1886. 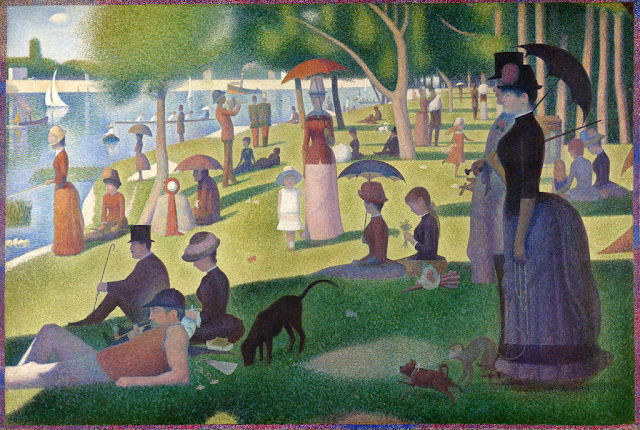 This painting depicts different members of each social classes taking part in numerous park activities. Seurat did not physically blend the color on the canvas, rather her used tiny juxtaposed dots of multi-colored paint which gave a kind of blend of colors optically. Thus this art work by Seurat comes out to be one of the finest examples of Pointillism.